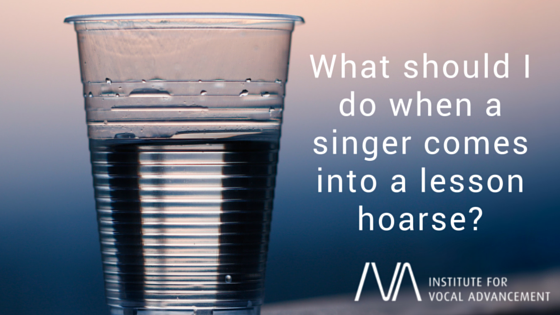 You are here:Home Vocal Technique What should I do when a singer comes into a lesson hoarse? As voice teachers, we need to have at least some basic understanding of vocal health. Each time a student walks in the door, no matter how many times we have taught them before, we should be listening to their speaking voice to gain clues on what we may need to address that day. We are human, and our instrument (the voice) changes from day to day. Our voices can be affected by the weather, dryness, poor health, inversions, allergies, hormones, and let’s not forget stress and lack of sleep. Medical conditions like muscle tension dysphonia, acid reflux, and even medications we take can affect the way our voice sounds and functions. Hoarseness is definitely something we need to pay attention to. There are many reasons one’s voice can exhibit hoarseness. If you have a new student with this issue—someone you have never met before—it is especially important that you question them about it before doing anything vocally with them. How long have you been hoarse? Does this happen to your voice often? If so, do you know what tends to trigger it? Are you aware of any medical issues that affect your voice that I should know about? If someone has been hoarse for two weeks or more and it’s a voice that you don’t know, I would recommend that you insist they see an ENT before proceeding with lessons, because hoarseness can be a sign of medical issues that need attention. speaking voice when they respond as much as I’m listening to their response to my question. It most likely will take longer to warm them up. I’ll never forget a voice lesson I experienced with one of my mentors when I had an onset of bronchitis. My voice was not normal . . . I was hoarse, but by the time he was done with me, I was speaking normally. I didn’t know it was bronchitis at the time; I just knew I must be getting sick, but I didn’t want to miss the opportunity to take a lesson from him. Of course a couple of hours later when the sickness was setting in and my voice was cold, it went back to being hoarse until after I was done being sick. Through this experience, I became a firm believer in the healthiness of good technique and how important it is to take lessons with someone who understands vocal balance and how to achieve it.